On Friday the exhibition „Stuff for Thought“ will open in Nuremberg. In the call for entries it had said that the city of Nuremberg, because of its history, feels a high responsibility towards the observation of human rights. Last September Mr Amirul Haque Amin from Bangladesh was awarded the Nuremberg International Prize for Human Rights. He is the President of the National Textile Union in his country and has been actively campaigning for improvements of working conditions in textile industry for many years. He will be attending the Nuremberg Peace Meal, and to celebrate this occasion the city of Nurember is calling for a Textile Exhibition in which works will be presented that deal with the topic of human rights. 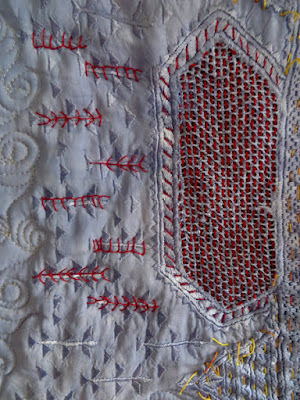 I had entered several quilts in answer to this call, and it was „Thinking of Nasrin“ that was selected. This quilt was made for one of our challenges for International Threads and uses not only three hand-embroidered squares from the Guldusi initiatve, but I also included a piece of fabric that women in Afghanistan use to make their garments, hiding their faces and bodies. The opening reception will take place on Friday, September 9th, 2016, at 7 p.m. at the Rathaus in Nuremberg (address: Wolffscher Bau, Rathausplatz 2). Should you be in the area, please come and join us for the reception. The exhibition will be on display until September 25th, 2016. Congratulations, I'm glad you put my unused square to such good use. Oh well done! I am glad this quilt will be on display for the prestigious event.